The following article is based on my dissertation, which I did fifteen years ago now. As such there is plenty I could add, or would want to change now if I had the resources to hand. At the time of writing there was a strict word limit to stick to, so there are some parts that I haven’t been able to address completely, and plenty of things that I wasn’t able to address at all. Even so, it still may be of interest. What we know of the Dagda comes primarily from the roles he plays in the Irish mythological tales and folklore that have survived through time. He appears in Irish mythology as a member of the Tuatha Dé Danann, sometimes its chieftain, and sometimes a senior or peripheral figure. The Dagda is a complex character – a magician and sorcerer, a chieftain, a warrior, a musician, a builder of the brughs and síd of Ireland, prolific lover and sometimes something of a buffoon who gets taken advantage of. Perhaps most memorable of all, he is known to his kin and his enemies alike for his legendary love of porridge. In literary terms he can be seen as being (at least partly) a divine being, as well as a well-loved figure of Irish mythology and pseudo-history. With this in mind, let us now look briefly at the literature that we will be dealing with. The Lebar Gabála, or “Book of Taking”, is an eleventh century text,5 but earlier versions of some of its elements exist in the ninth century Historia Brittonum, written in Wales, which was later translated into a Gaelic version. It is interesting that certain elements of the tale from the Historia Brittonum, including the Tuatha Dé Danann, are missing,6 perhaps suggesting that the Tuatha Dé Danann were either deliberately omitted from this version – or had not been added into the overall framework yet. While the contents of the Lebar Gabála may show largely the “original” content of the mythology it is based on, it is difficult to determine how much has been changed, misunderstood, Christianised or romanticised, and made to fit within the pseudo-historical framework. But this does not mean that the Lebar Gabála is without value or mythological importance,12 as the consistency of the genealogies used within the Lebar Gabála, compared to the Dinnshenchas, for example, show that some elements at least were preserved consistently. Perhaps the richest source of mythological information concerning the Dagda, and the Tuatha Dé Danann in general, is the tale Cath Maige Tuired, or “The Battle of Mag Tuired”, commonly called “The Second Battle of Mag Tuired” to distinguish it from the probably later “First Battle of Mag Tuired.” Cath Maige Tuired is found in a relatively late manuscript of the sixteenth century, but elements – based on linguistic analysis – appear to be from the ninth century at the earliest.13 Much of the beginning of the tale has been derived from the Lebar Gabála, presumably inserted by the redactor to place the tale within the larger context of the Mythological Cycle.14 Cath Maige Tuired, set against the battle between the Tuatha Dé Danann and the eternal enemy of the Mythological Cycle, the Fomoire – fo, “under”, morii, “sea”, “the undersea dwellers”,15 is probably earlier than the First Battle, as the First Battle is the only tale of the two to distinguish the order in which it was fought, implying the Cath Maige Tuired was well known enough to need no distinction. In addition to the myths, there is the body of folklore known as the Dinnshenchas that is relevant to the Dagda and the Tuatha Dé Danann as a whole. As Sjoestedt puts it, the “Leabhar Gabhála is the mythological pre-history of the country and the Dinnshenchas is its mythological geography.”16 The Dinnshenchas is twelfth century in origin, and is a massive collection of onomastic lore explaining the origin of place-names in mythological – not necessarily true – terms.17 Dealing more with folklore than mythology, it sets the Tuatha Dé Danann, saints of Ireland and historical people within a somewhat mystical landscape, where they all co-exist. Outside of the Mythological Cycle, where the Tuatha Dé Danann are seen as rulers of Ireland, they are believed to have retreated underground to become the aes síde, or fairyfolk of Ireland,18 after losing their supremacy of Ireland to the Sons of Míl. It is in this context that the Dinnshenchas mainly deals with the Dagda, as a member of the síde, resident of the Otherworld. It should be remembered that the Dagda is a complex figure, who has evolved throughout history – from his pagan inception, his Christian recording and re-recording, and our modern interpretations. He exists in many layers, and it is impossible to separate these layers to get down to the “real Dagda”, if there ever was one. From his appearances in mythology, recorded in Christian times, we can perhaps infer some of the Dagda’s divine functions as a god. What attributes he developed before or after Christianity is more difficult to guess, but any later accretions make up just as much of the “real Dagda” as the earliest ones do – from a god, to a mythological figure, and a member of the aes síde. The Dagda is “the Good God” – not for any moral sense of the word “good”, but in that he is skilled at many things.19 But this is not the only name, or title, that the Dagda is known by. Cath Maige Tuired tells us how the Dagda was given his best known title: On asking all the skilled men of Ireland what they can do to help the Tuatha Dé Danann’s cause against the Fomoire, Nuadu finally turns to the Dagda, and asks what he will contribute. The Dagda replies “’The power which you boast, I will wield it all myself.’ ‘You are the Dagda [the Good God],’ said everyone; and ‘Dagda’ stuck to him from that time on.”20 In other words, the Dagda will carry out all that the skilled men of Ireland have pledged to do, himself. He is also known as In Ruad Rofhessa “The Red One of Great Knowledge,” or “The Lord of Perfect Knowledge,”21 “for it is he that had the perfection of heathen sciences”22 – as the episode from Cath Maige Tuired illustrated above shows. It has been suggested by Daithi O’Hogain that the reference to the colour red refers to the Dagda’s associations as a solar deity; however Ó Crualaoich notes that the colour red is generally associated with Otherworldly beings and so here it might be assumed that the attribute refers to the origin of the Dagda’s knowledge, which would be in keeping with his Otherworldly associations (as builder of the brughs as well as his powers over life and death – with his club – and his power to give unlimited sustenance with his cauldron). These are just two epithets by which the Dagda is called, which occur frequently within the tales he is mentioned in – such as Lebar Gabála and The Wooing of Etain,24 but rarely is the Dagda referred to by an epithet without being identified as the Dagda as well. It should be remembered, however, that technically all these names the Dagda possesses are titles, rather than actual cognomens, as it were. In Cath Maige Tuired, the Dagda reveals his full name, or at least so it seems, in the episode where he seduces Indech’s daughter – an episode that will be studied in more detail later. With his belly full of porridge, the Dagda is berated by the daughter of Indech, his enemy, for a lift on his back. Under geis, a religious prohibition, the Dagda is not permitted to give anyone a lift until they ask him formally by his full name, and so he reveals it to Indech’s daughter, bit by bit, while taking the opportunity to relieve himself of his huge dinner as he does so.25 His name is revealed as “Fer Benn Bruach Brogaill Broumide Cerbad Caic Rolaig Builc Labair Cerrce Di Brig Oldathair Boith Athgen mBethai Brightere Tri Carboid Roth Rimaire Riog Scotbe Obthe Olaithbe,”26 and its meaning has not yet been fully translated by modern scholars, so obscure that some of his names are. Those epithets that can be translated appear to reflect “both his immediate condition [i.e. heavily bloated] and enduring aspects of his character. Oldathair… is found elsewhere, but the other names seem to describe his distended person, his soiled state, and his on-going association with creation and regeneration.”27 So here, his name appears to reflect both his nature, and the result of that nature: the predicament he is in at that time – both productive, virile and fertile, progenitor of abundance. Whether this is the Dagda’s “true” name is doubtful, because although long, it is not seen in any form (apart from Oldathair) elsewhere. It is perhaps more illustrative of his character for this episode, rather than a popular title by which he was commonly known in pre-history or later. Through the titles given to him, the Dagda is seen to be a skilled, wise, and paternal leader. Great Father; a possessor of great knowledge and wisdom; skilled at many things. These can be seen reflected in his actions, but also in the objects, people and places he is associated with as well. This idea of sacral kingship is often portrayed in mythology. The king, acting as mediator between his people, and the gods – the social and divine – does so in accordance with a contractual agreement between his people, and he may lose his position if he does not fulfil certain obligations of his kingship – like if he is not a successful military man, for example.31 To a great extent, mythology will be illustrative of such sacral kingship, particularly when things go wrong, as so many tales attest – like the Táin Bó Cúailnge. As a chieftain, we can see that the Dagda embodies wisdom (particularly with his epithet In Ruad Rofhessa), hospitality and generosity – almost the direct opposite of Bres, through his actions in mythology. Yet he is also, in a sense, a paradoxical figure as it is often the result of his son Oengus’s help that the Dagda manages to extricate himself from many a sticky situation. Added to this, the Dagda’s associations with the cauldron of abundance also neatly ties in with his role as a virile god, who mates with goddesses and women alike, and has many children besides. Miranda Green notes that many goddesses are associated with vessels or vats, as well as water,39 and if we think of the Dagda’s union with Boann, river-goddess and personification of the river Boyne, to whom she gives its name, we see a neat symmetry. 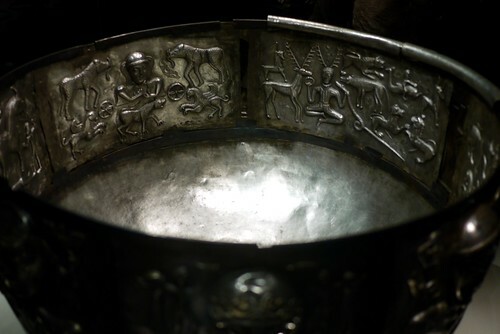 Feasting was certainly a central part of early Irish society, as many tales – like Mac Da Tho’s Pig – attest, and so the cauldron became a focus of abundance, and as the centrepiece of a feast, a symbol of hospitality as well, which the Dagda is undoubtedly associated with. It is perhaps the Dagda’s inextricable association with hospitality and abundance that he gets into the stickiest situations, but also his most triumphant victories. But more than anything, it is the Dagda’s roles as chieftain and fertility god that underpins his actions in almost every tale. And why not? After all, both of the Dagda’s “attributes” apparently have life giving properties. As Otherworld beings, they lived in the brughs, or síd mounds, built by the Dagda, or else beneath lakes, the sea or on islands off the coast,57 and these features in the landscape were seen as entrances to the Otherworld, as well as exits into this world for the inhabitants. It can be seen that each brugh is commonly associated with specific people, in a highly localised landscape: Bri Leith, for example, is the home of the Dagda’s son Midir, whereas Bodb resides at Síd al Femen in Co. Tipperary.58 The Dagda himself kept Brugh na Boinne, now identified with Newgrange, a neolithic burial chamber, but it was tricked out of his possession by Oengus, his son, in a story that will be discussed in the next chapter.59 Before being usurped of his dwelling, the Dagda’s brugh was described as being “Wonderful then, is that land. Three trees with fruit are there always and a pig perpetually alive, and a roasted swine and a vessel with marvellous liquor and never do they all decease,”60 and so once again we can see the aspects of the Otherworld and plenty being reinforced. The Otherworld, in many respects is an ideal, where there is no hardship or famine – an important concept to a pastoral society, one could say. Note also, from the introduction, that such places in the landscape – either rivers, wells, hills or mounds were often associated with divinities, or were considered sacred places. So we can see that the Dagda’s associations with the Otherworld, and his role as a chieftain are intimately related, in mythology as well as religion. 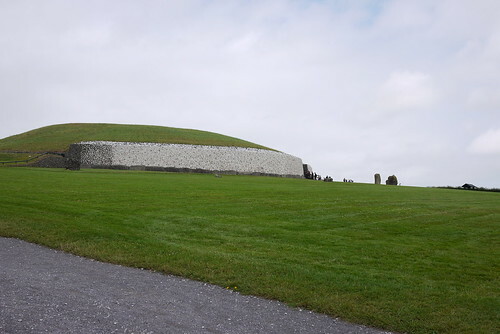 Traditionally, the neolithic tumulus at Newgrange is identified as being the prehistoric burial place of the kings of Tara,66 but it is also said to be the resting place of the Dagda and three of his sons.67 Could this be a coincidence, or deliberate association? This would not be the first time that the Dagda is associated, one can only assume deliberately, with the more historical rulers of Ireland, a theme which will be returned to with the Dinnshenchas.